Ok, y'all (side note: now that I'm a Seattleite I never say that word outloud, but boy does it feel good to type it!). Daylight savings has happened. The days are officially darker, and Fall - and perhaps even Winter - are already here. 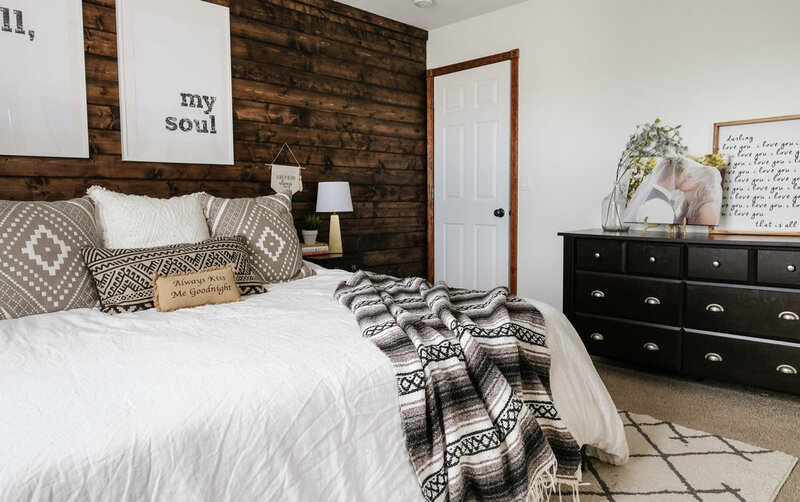 Today, we're taking off to Montana and fully embracing all there is to love about this season with a tour of Ashley's home. It's some mutt-ish mix of boho, mid-century, and rustic and replete with all the Fall vibes. This is a perfect opportunity for an edition of "I Spy: StyleMutt Home Reader Design." Count the Fall references in this home - all things layered, cozy, and Thanksgiving-inspired - and we'll see if we come away with the same number. Deal? This oasis was created with a lot of DIYing, bargain hunting, and creativity. In the living room, Ashley and her husband transformed the cookie cutter box fireplace into the stunning stone masterpiece you see. All it took was a lot of sweat and, per Ashley, maybe a few tears! 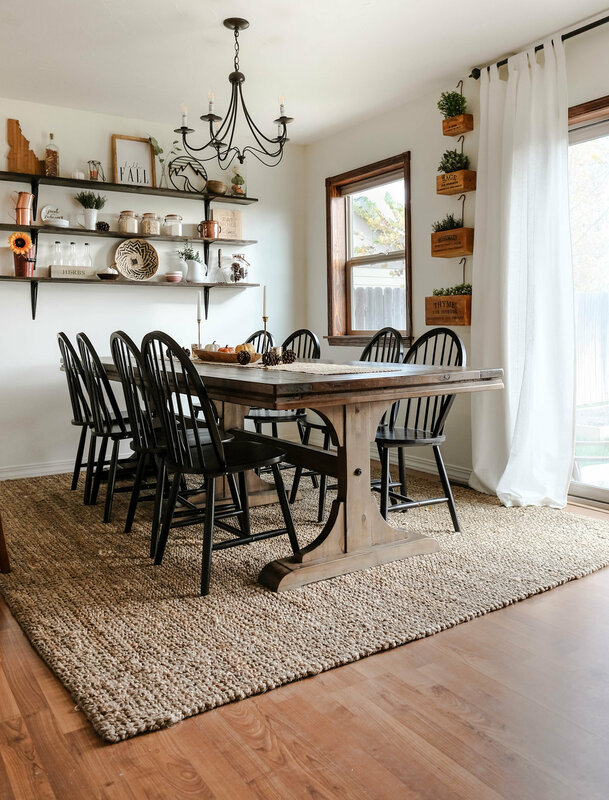 In the living room, they negotiated and landed a "dinged" floor model version of the farmhouse table they were eyeing; those display scratches didn't detract at all from the table - in fact, they added character! 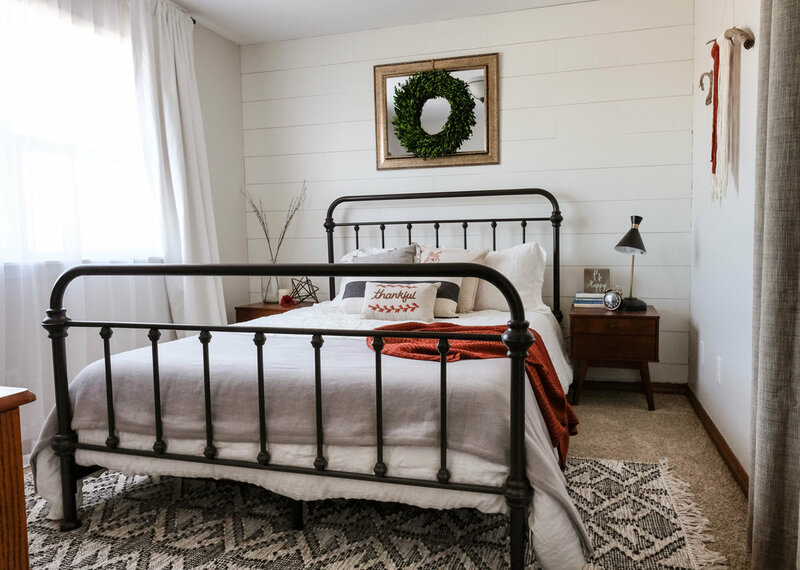 In the master bedroom, they added some character again with a DIY shiplap wall. Now... I know what you're thinking. Thank you, Joanna Gaines, for the shiplap obsession that's rocking the nation. But Ashley knows that despite its current trendiness, the feature is still completely her. At the end of the day, all that money and time is well spent if the results makes you feel content, happy, and home. Thank you for the tour, Ashley! Your home is so full of love and built to withstand any season. Follow Ashley along on Instagram @ashley.joyfullygrowing for more. See you all next week!